There is many long range air to air missiles available in the market, yet the Meteor is the known best missile in the air combat. The main reason is not only the long range, but its modern guidance systems and data links makes Meteor is the most successful missile in the modern aviation history. Nations like US and Russia also had long range missile, however they were lags behind meteor's performance. The famous aviation blogger hushkit shortlisted Gripen as second in the top ten list of worlds best BVR fighters, as many surprised the entry of Gripen in second place right after the Raptor. As the title already suggested it's Top 10 BVR fighter. The Gripen comes second because of its meteor missile. Gripen is the single engine medium weight aircraft, developed to perform multi role missions. So far Sweden supplied Gripen to many nations, due to it's low cost, higher sortie rate and low operating cost. In India it was rejected due to many reason, which include single engine and not good enough characteristic for air to ground strike mission. Gripen is the only aircraft who gets the Meteor missile in full configuration as of now, which include mid course update using the data link and active seeker usage in terminal phase. Meteor missile is the 300km long range missile, can autonomously find and kill the target in long range, allows the launch platform safe to exit from the threat zone. This makes the enemy platform had no idea about the origin of the launch platform. All the modern European fighters soon to be equipped with the Meteor missile, makes the European fighters can dominate the future battle with the Meteor missile. Typhoon and Rafale is in final phase of meteor integration. Once they too get the missile as operational status. Rafale comes in second place with the RBE 2 AESA Radar, along with the Low Radar cross section and the Spectra EW. The Above said combination changes entire battlefield, The Rafale saw the target first, use the LPI radar to track the target, guide the Meteor till the terminal phase, and fall back to the safe zone. This makes the enemy has no idea who is coming, who is hitting,and how to escape. Modern missiles are more smart, There is no fault reported in recent days, As many nations used to bring down the UAV's and the recent Su 24 shot down using the Turkey F 16 armed with AIM 120. The verbal word dog fighting almost end, after the active guided missiles entered the in the battles. Means the maneuverability of the fighter aircraft becomes useless in these days. The US uses the AIM 120 D whose range is about some 160 kilometers, AIM 120D also had similar capabilities like the Meteor. However it's just some 160 km range. 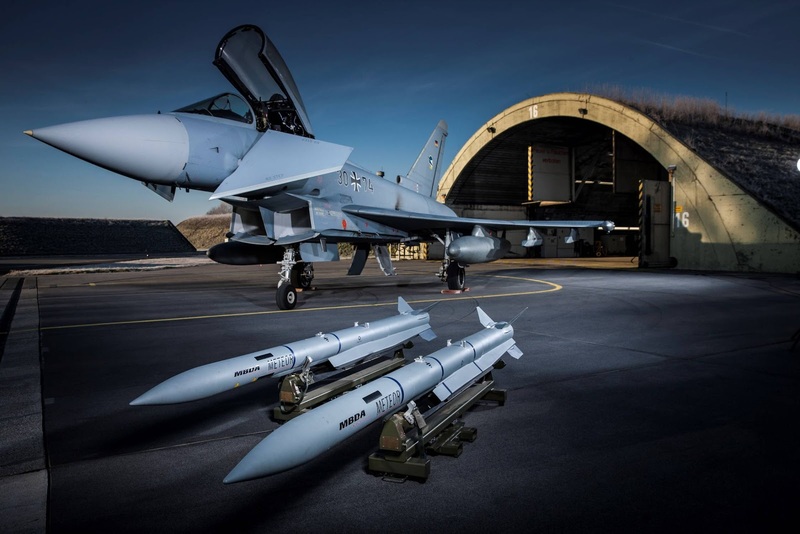 The AIM 120 D is operational in few air forces like RAF, IDF and UK Air force. while it's predecessor is used by many countries which include Pakistan. Hushkit gives first rank to Raptor, Since it had stealth characteristics and LPI Radar. which makes very difficult to lock the Raptor by enemy fighter jets. AIM 120 D is the main weapon of Raptor. The Russian had a long range active air to air missile, called R 33, it uses a combination of semi-active radar homing for initial acquisition and mid-course updates, and inertial navigation to reach the target at extreme range. The Zaslon phased array radar of MiG-31 allows four missiles to be guided simultaneously at separate targets. However compared to the meteor's mid course update and active radar homing characteristics, the R 33 short in legs. Russians is developing a new generation air to air missile based on the R 33 called as R 37, having characteristics like Meteor, however longer range and speed. In India the MKI uses the R 77 BVR missile as main weapon, The MKI radar is long range detection capability, however the missile range capped at some 80 kilometers. IAF also uses the R 27 missile for long range, that's some 120 kilometer. India once asked the MBDA, about the possibility of adding the meteor missile in the MKI. However the status is unknown, mostly the plan was withdrawn. Japan is going to be emerged as a world's best missile operator once they made the JNAAM with the support from MBDA and Mitsubishi, the missile gets Japanese modern seeker and MBDA's modern missile technologies. Once the missile ready Japan and UK among the two nations who operates the modern long range missile. India will get the Meteor with the Rafale package and R 37 with the PAK FA package.